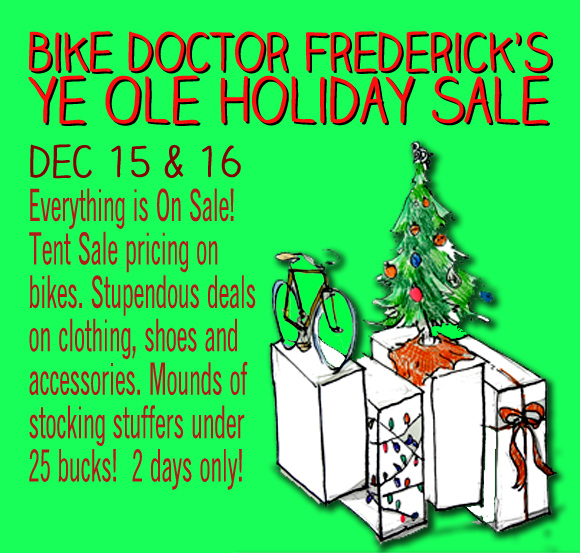 Tent Sale Pricing on all bikes, even special orders. That’s the best pricing we do, ever. At least 10% off all accessories. Some stuff will be higher. Helmets, lights, handlebar tape, tires will be 15% off. Additional 25% off on all clearance clothing, which is already at ridiculous pricing. Additional 25% off on all clearance shoes. We have a boat load of them. Take advantage! 20% off on Shimano M087 shoes (great mtn shoe) and Shimano M520 pedal combos. This isn’t clearance stuff, its just an awesome deal. 20% off only if you get the pair. Great deals on stocking stuffers, including loads of stuff normal bike shops don’t stock, handmade t-shirts, hand screened pint glasses, artwork, handmade whimsical bells, the list goes on. 20% off on all Books and DVDs. We have some really great books! Buy one for someone you like, even if that’s yourself. Here’s a quick peek at some chimerical stocking stuffers that won’t end up in the regift pile. These simple, colorful pint glasses are hand printed in Denver, Colorado by Vital Industries, which is just two folks making well designed mostly bike themed objects d’ home. That wasn’t supposed to be real French, so don’t send any mean letters! 20 bucks gets you 2 of these. They also make classy looking ‘old fashioned’ glasses, which is either a juice glass or a bourbon glass, depending on how your tastes run and maybe your age. Ruff Again makes these dog collars out of old inner tubes that we give them. Locally made, and well made. They are tough, come in fun colors, and are fully adjustable. Small, Medium and Large sizes, with the biggest topping out just under 25 bucks. Crane hand-painted bells. Made and painted in Osaka Japan. Crane started by using recycled rotary telephone bells, but those eventually ran out, so they copied that tone and look with these beautiful bells. They also come in silver aluminum, real brass and real copper. The painted ones are a bit more than the plain ones, but they are lovely fast little paintings, and each one is unique. They are just under $25! We commissioned Dear John Goods, a local company specializing in upcycled products, to make a variety of jewelry from bike parts. There are a bunch of different flavors, all priced below 25 bucks. Support local artisians! Where: Bell Tower (near the Talley Rec Center) in Baker Park. When: Dec 19th, Meet at 8.15, wheels down at 8.30 DON’T BE LATE! What: Short (sub 5 mile) slow ride thru the best x-mas lights in the town. Why: Because even bad x-mas lights are good. Who: Anyone who can handle a bike in a big group of people. What to bring: at least a headlight and tail light. Battery powered x-mas lights are highly encouraged. A lock if you want to hang out post ride. Warm clothes. Eric here. I just want to thanks James and Brian for the Salsa Casseroll frame I grabbed on Saturday. I finished moving everything over late Sunday afternoon and I love the ride. The bike is an excellent replacement for the Origin-8 I was riding. Handles much better. Thanks again guys. Happy New Year !! Eric, good to hear it’s already built up! Send a pic when you get a chance.